This part of Germany is unspoilt with scenic waterside towns and villages. You are unlikely to see any other British visitors during your boating holiday, although this area of the former DDR is now becoming more popular with German tourists and boaters. The canals are very peaceful and there is superb bird life – you may see osprey, storks and many birds of prey, and nature reserves are visible from the canal or by bike. Our week included a mixture of canals (Muritz-Elde-Wasserstrasse) and lakes (including PlauerSee and SchwerinerSee). This area is noted for its smoked fish (cooked and raw), so fish-lovers will have a very enjoyable time. Pork is a very common meat dish. There are also many local beers. We recommend a German phrase book to help translate menus, although some restaurant staff may know some English. This boating holiday would suit adventurous nature and outdoor lovers seeking an unspoilt scenic area for a holiday away from British voices. For full enjoyment some knowledge of German is advisable, and previous boating experience is extremely desirable. We drove from Zeebrugge to Bremen. Bremen is a good staging point with a historic Old Town and an interesting riverside. The buildings around the Market Place are a World Heritage Site, and the fascinating Bootchere Street contains many unusual buildings. The Hilton and Ramada Hotels are situated here, close to the many AltStadt beer taverns and a Brewhouse. On the fringe of the Old Town is the Ibis Altstadt, a good but inexpensive option. From Bremen it was a morning drive to the base at Matzlow. After passing Hamburg we crossed into the former East Germany and a very rural landscape. Before reaching Matzlow we diverted to Ludwigslust with its imposing Schloss, the castle built by King Ludwig. We also took the opportunity to stock up with fresh food at the local supermarket. Easily finding the base we unloaded the car and completed paperwork formalities. Andreas, the Locaboat Manager, then showed us over the 1020FB Penichette and explained its workings – much the same as other boats we had been on. We then drove the boat, with his guidance, to the nearby lock. On this waterway most locks are automatic and monitored by video camera. A few have lock keepers. Either way there is no need to get off the boat - a luxury for those of used to the hard work of UK manual locks. From Matzlow it was a 90 minute trip along quiet canals to the town of Parchim. Mooring at a new quayside a short walk to the town centre we soon went to the StadtKrug restaurant with its many local Mecklenburg dishes at inexpensive prices for high quality food. On the Saturday evening we were there the staff showed how children-friendly this part of Germany was. Of course, there were many local beers on offer. After dinner we saw many historic sites and returned to the Penichette for a good nights sleep. Setting off from Parchim at 9am we stood outside steering the Penichette from the Flying Bridge. All around we could hear the song of birds and watch their antics as they flew around the boat or the nearby reeds, trees or meadows. Apart from kingfishers and birds of prey we saw a yellowhammer, red-backed shrike, and hooded crow and heard many warblers around about. Our first lock, after 10km, was automatic. On arrival you turn a blue lever at the waiting quay and then wait for the green light. If necessary the lock is emptied or filled automatically before the gates open. This time there was a boat in front of us who had got the lock ready so we went straight in. The gates closed behind us - the electronic information board told us what was happening at each stage. The water rose - we were going uphill - and eventually a green light told us to leave. We cruised through interesting scenery until we reached Lubz - noted for its brewery - through two lock keeper operated locks and another automatic, until reaching the lock at Plau. The real fun was the lift bridge in the centre of Plau - this was raised every hour or so, stopping the traffic and causing chaos. We then turned into the Marina. For 12 euro we had power, water, showers and a mooring a few minutes from the town centre. On the recommendation of the HafenMeister we ate at the fish restaurant overlooking the waterway. Its menu included pike, zander and eel, as well as the new season’s young herring, Matjes. After a quick look around town we returned to the boat and slept like logs. From Plau we set off across the Plauer See, about 2km across. Following the channel with its green and red marker buoys, we reached Lenz and then into the narrow Petersburger See. There were numerous Great Crested Grebes, moorhen, and distinctive boat houses at the side of the lake. At Malchow we waited for the hourly opening of the swing bridge to the town moorings. A good crowd assembled to watch the boats pass through whilst car traffic queued for a frustrating 15 minutes. Unfortunately the heavens opened when we were in the town so we got drenched. Going back through the swing bridge it was another scenic trip back across the lake to Plau. We were able to moor along the waterway towards the lake using the mooring spikes and gangplank provided with the Penichette. Our evening meal was at the hotel restaurant by the lift bridge. Sitting outside we watched the house martins swooping for flies just above the water. We counted over 100 nests under the nearby bridge. Later sitting outside on the rear deck we could feel the draught as the birds swooped past us. Getting up early we looked at the Plau Market, bought fresh bread and called in to the fresh fish smokery for some newly smoked herrings. We were through the lift bridge for its 9am first opening of the day, and then through the lock. With the locks taking up to 6 boats at a time, most of these boats went through later locks with us. Bird song was ever present as we cruised along - the days highlight was seeing a stork's nest with 2 storks and then a stork high in the sky riding the thermals. Stopping for lunch in Lubz we found that the well-known local brewery offered tours at 11am, bookable in advance. The Turm at Lubz was an interesting sight. Cruising through the afternoon we reached the extensive public moorings at Parchim. After another superb and inexpensive meal at StadtKrug we sampled the local BrauHaus before returning to the boat. First through the Parchim lock at 9am we called in to the Matzlow base for a quick free pump-out on our way to Schwerin. Cruising along the Canal we saw an osprey as well as kites and many herons. There was just one lock with an associated drawbridge and then a wait for the lift bridge at Plate which opens every 90 minutes from 10am. 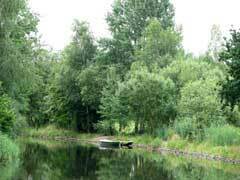 After about 30 minutes the tree lined canal gave way to the wide open spaces of the Schweriner See. Following our map showing the red and green marker buoys we had to pass we soon saw the shining golden dome of the fairy tale SchlossSchwerin Castle. Crossing the lake we were soon installed in the local Marina and getting helpful info from the English speaking HafenMeister. Facilities included hot showers and launderette as well as a bar-restaurant. It was a short stroll to the Old Town and its many attractive buildings. We soon identified a restaurant for our evening meal. After changing from our boating clothes we returned to Lukas Restaurant where as usual one of us had a local smoked fish main course and the other had one of the regional pork dishes. With starter and dessert the total cost in Euro was what the meal would have cost in pounds – the UK would have been 50 percent more! Today we had earmarked for exploring historic Schwerin. The Schloss is now the home of the LandTag or Regional Parliament for the Mecklenburg-Vorpommern region, formerly part of the old DDR. Ministry buildings were all around Schwerin, helping its other image as an arts and culture centre. The Schloss includes a good Museum but also has two interesting formal gardens. The Burggarten surrounds the castle with the formal SchlossGarten to the side. At the end of the SchlossGarten is the Water Mill which shows how stone was cut and ground through a very lengthy process. The StadtMuseum includes a good selection of Dutch paintings including a possible Rembrandt. In the evening we ate at Friedrich's Restaurant overlooking the inner lake, the Pfeiffentich. We left Schwerin at 8.30am crossing the flat calm lake with the Schloss receding in the distance. Through the lift bridge at Plate at 10am we were able to divert to the Lewitz Nature Reserve lakes towards Neustadt Glewe. This was rewarded by views of osprey, one with a catch in its claws, heron, and deer. Halting for Kaffe and Kuchen we then made our way back to Matzlow Base, testing the Penichette’s cooking facilities with a final meal on board. The ever-present hot water on the 1020FB was the best we had experienced on a boat. We packed and then tidied the boat, completing the leaving formalities with the Base Manager, and looking back on a varied and very enjoyable week. We then drove north to the fascinating resort of Warnemunde, on the Baltic (OstSee) coast and further explorations of Eastern Germany before returning to the UK via Rotterdam.